AdWords Attribution: Give Your Clicks Some Credit! The new attribution model for AdWords was the talk of the town when it was first announced in 2016. But since then, it hasn’t received as much attention. Even so, I was surprised recently when a colleague in the pay-per-click industry confessed that he wasn’t aware of it. I can understand how he missed it. After all, it’s one of those AdWords settings that you can easily overlook if you don’t know it’s there. Therefore, in this article, I’m going to recap what attribution settings are and reveal what you can expect if you start using the new models. Basically, “attribution” is about assigning credit to clicks that lead to conversions. For example, say “Dan” wants to buy a baseball jersey. So he searches “baseball jersey” and clicks on an ad. After a few more searches, he decides he wants a Red Sox baseball jersey. So he does some more searching and clicks on another ad from the same company. He then buys a jersey from that company. How do you want to attribute credit for the sale? Should the first ad Dan clicked get the credit or the second? Or a combination? That’s what attribution is all about. Before Google rolled out its new attribution model, attribution was given to the last ad clicked. But this didn’t always accurately reflect what was happening in the account. In the baseball jersey example above, the last ad would have gotten all the credit for the sale. At the time, we could use Google Analytics assisted data to give us a fuller picture of what was happening. But it could be a hassle to try and “meld” Google Analytics data with what we were seeing in AdWords. This all changed when Google rolled out its new attribution models. Most advertisers measure the success of their online advertising on a “last click” basis. This means they give all the credit for a conversion to the last-clicked ad and corresponding keyword. However, this ignores the other clicks customers may have made along the way. 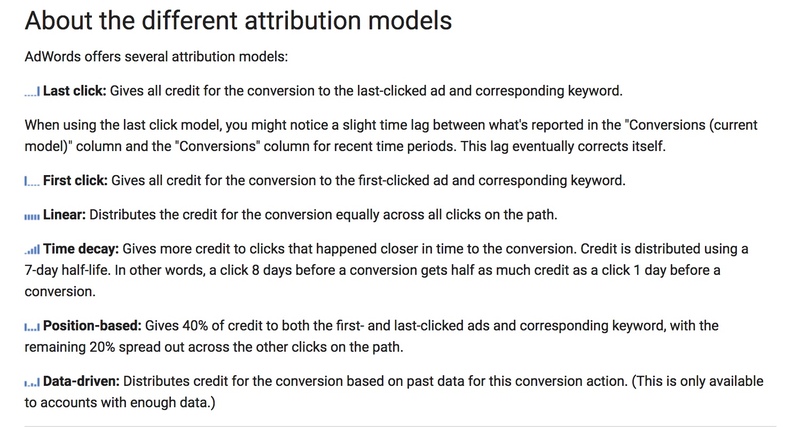 Attribution models give you more control over how much credit each ad and keyword gets for your conversions. With this change, PPC pros could now choose which attribution model to use. And now instead of having to cobble together data from AdWords and Google Analytics, all this functionality now resides in AdWords! Under some of the new models, you may see a drop in branded conversions but an increase in non-branded conversions (i.e., credit given to a branded ad versus credit given to a non-branded ad). This isn’t a bad thing. We were always convinced that non-branded ads contributed to conversions, but it wasn’t always easy to show that with the data. Join North Star Inbound’s founder Nicole DeLeon on Wednesday, April 18 at 2:00 PM Eastern. DeLeon will offer advice on how to leverage white hat link building to improve your backlink profile as well as earn traffic. But now, the contributions of non-branded ads are more obvious. It confirms what we always suspected: It’s not uncommon for people to click on a non-branded ad earlier in the path to conversion and then click on a branded ad later as they get to know your brand. Under the last click model, branded campaigns would often get all the credit. (“All our conversions are coming from branded campaigns!”) And we might be tempted to pause our non-brand campaigns. But now the data shows that would be a bad idea. Having this fuller (and more accurate) picture of what’s going on makes it easier to optimize client accounts. While having multiple attribution models to choose from is great, it isn’t always easy to know which ones to choose. We were happy to move away from the last click model, for all the reasons explained above. We decided that first click wouldn’t make any more sense for most of our clients – it would merely shift the overemphasis from the back end of the conversion path to the front end. Therefore, we’ve been mostly using position-based attribution and linear attribution for our clients. We like these two options because they give credit to clicks that are distributed throughout the conversion path. Unfortunately, we haven’t yet had the opportunity to use the data-driven attribution model as none of our clients have accumulated large enough amounts of data to make it available to us. Because some of these models are attribute portions of credit to different clicks, we often see partial conversions (e.g. ¼ conversion, ½ conversion) in accounts. To minimize confusion, we’ve taken to rounding up these fractions when reporting to clients. We don’t want to get into a lengthy (and distracting) discussion about what, exactly is a “¼ conversion”! 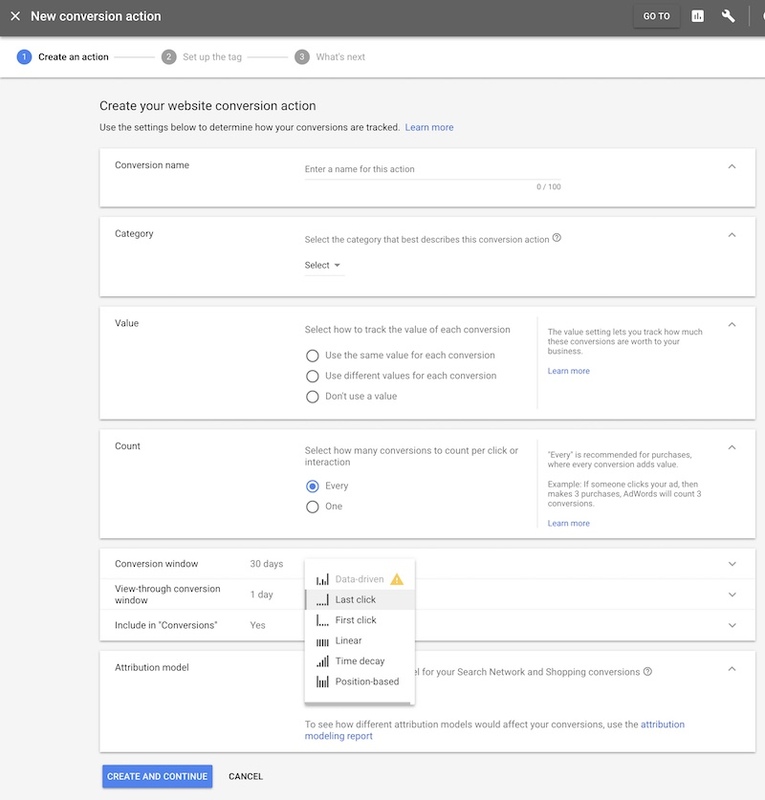 If you’re inspired to play around with the attribution setting on your accounts, you’ll find it under Conversions in AdWords. With AdWords changing every day, it isn’t surprising that some industry folks (even experienced ones), might have missed the boat on different attribution models. While these models might seem a bit confusing, they’re well worth exploring. You may end up with a more accurate picture of which ads are driving your conversions. Source: AdWords Attribution: Give Your Clicks Some Credit!